Christine LaChow is a graduate of the School of Visual Arts in New York. An art teacher and a working artist/illustrator in the New York/New Jersey area, Christine has had many exhibits and won numerous awards. Mary was following a beautiful butterfly when her feet landed in a soft spot on the ground which was covered with hay. Without any warning, she fell through a deep, dark hole into an old well. Scared, Mary tried to see but it was dark. Just then, she felt something slimy jump on her and she screamed, "Benny, help! Go get Daddy!" Benny looked at the winding path and tall shadow of the trees and he panicked. "I don't know my way home," he cried. About Tiger! Tiger! Tail On Fire! Betty is very tiny for her age and sometimes feels insignificant. 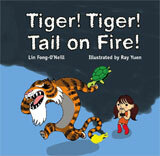 But when a bullying tiger threatens her and her family with harm, she realizes that her size does not matter. With courage and helpful friends, Betty uses her intelligence to outsmart her enemy. This story allows children to identify with their fears of taking on someone bigger and stronger than they are, and learn at the end that �you are as big as you feel.� The engaging story and delightful illustrations will please readers of all ages. Graphic designer by day, illustrator by night, Ray Yuen credits many hot summers drawing caricatures at New Jersey theme parks for honing his illustration skills, which now have evolved into professional calling. He lives in Brooklyn, New York. Tiger entered and revealed himself, roaring. She was very frightened indeed, especially when she saw Tiger wearing Mommy�s jacket. He was so tired from his journey, he started to snore almost immediately. When Betty saw that Tiger was asleep, she snuck out of the house. A while later, she came up with a plan and decided to ask the people she trusted to help. Daddy, Why? is an illustrated children�s book. Seven-year-old Billy questions his biological father why he wants to adopt a child. Trans-racial adoption is also discussed as Billy inquires about the people who adopted "a different looking kid." Daddy uses adoption to tell Billy that love happens regardless of age, appearance, or racial makeup, and that the more love one gives, the more love one receives. The story is perfect for all children, especially adopting or expecting parents as well as young siblings-to-be. Adrianne Spota was born and reared in the United States. Of Italian descent, she is one of many artists in her family. Adrianne left a career in business to become an art teacher, combining two defining characteristics of her heritage, value in education and a love of art. She is married with two grown stepsons and a young daughter and son. The family lives in a historic home in Marlboro, New Jersey. I wrote this book to inspire children and parents to be open-minded and to respect diversity. The conversation between seven-year-old Anna and her mother who are Asian covers differences in appearance, family, culture, disability, marriage and love. The dialogue is direct and loving; Anna learns to understand and value her being different from others, and that appreciating their being different is a good way to grow up. Children, parents and teachers will enjoy reading this book. Hye Jung Yang was raised and educated in Korea where she earned a Master�s degree in Art Education from Yeungnam University Teacher�s College. She has worked as an art teacher, theater and dance stage designer, interior designer, and participated in many group exhibitions. Hye Jung left Korea in 2001 to attend Parsons School of Design in New York City. A 2004 graduate, she is an interior designer and freelance illustrator. "Mommy, why is Aunt Susan different?" Anna asks. "Grandpa said, 'A woman not married is like a cup without a saucer.'" "It is not true," her mother explains. "Life is full of choices. Being married is fine, so is being single." "Grandma and Grandpa are not happy because Aunt Susan is not married. Why are you?" Anna asks. "I respect their feelings," her mother answers, "but I don�t have to have the same ones." "Is having different feelings okay?" "It�s not only okay, it�s even expected sometimes." �Lin Fong-O'Neill gives a voice to the sweetness and innocence of a child's soul. She answers the child's questions about differences and diversity with the love and wisdom of the mother we have had or have wanted."